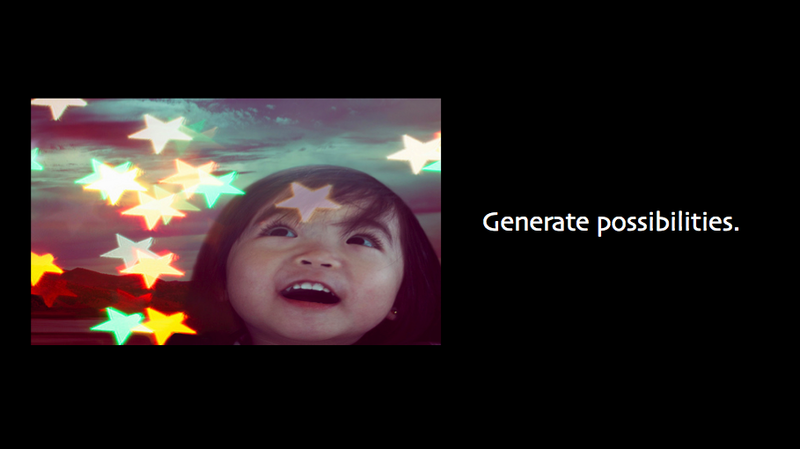 Generate possibilities. This is not merely true of digital – no matter what your realm, any planner worth a pay check should be coming up with possibilities. But when it comes to applying this principle to digital we have to help our creatives get started in a different way from an ATL project. What do I mean? Well, I think our briefs are a fine place to start. When I see “single most important thing to communicate” on a brief I want to throw up all over it. This is not to say that the problem should not be framed pointedly, but we need to evolve beyond the old guard’s boiled-down bull’s eye phrase. Briefs should have many directions to push off of that still fit the strategy and planners have to show the potential of the strategy with viable idea starters. This is yet another place where CPB has other shops beat. The Crispin brief is truly brief. But be careful not to think you can just adopt this method in your own work (well, maybe you can, I’ve got smart readers). I was just talking about this last night with a former CPBer – we know other former Crispin creatives who tried to implement this brief at other agencies and it’s never been done sucessfully. Perhaps one reason is that making it tighter takes a lot more time. But the even harder bit is that you have to learn how to write tensions that make sense for your brand while still respecting the concept of tension. There has to be some edge. Russ Klein from BK used to say he had to feel uncomfortable reading it. This is the place where cracking human behavior opens possibilities. Then there’s the Talk Value section. This is the place to get grains of possibilities into the brief. But generally we’d write it from the perspective of what would a person say about this idea if they experienced it. Get’s you thinking in that two steps ahead, predicting the future kind of way. I also think Griffin Farley has some very smart thinking about the ability for one group to set off another that he calls propagation planning. Especially with digital, we have to think about how (or from whom) people will get information and entertainment or conversely share their opinions and what they find interesting. This can lead to very interesting ideas as his slideshare shows. I’m really keen to hear more ways you’re generating possibilities for your brands that I can steal – please leave a comment!